So you've decided to clean house. To finally get rid of all the accumulated clutter around the house that has slowly taken over, or all of those unnecessary items you've held onto but never used. We at Bin There Dump That Wachusett Area can help! We provide hassle-free residential friendly roll-off dumpster rentals. Our uniformed drivers are skilled, professional, and approachable when it comes to any questions you may have, or even to show you how to use the accessible double back doors on our bins that make for a smooth loading process. Last but not least, we provide a property protection guarantee with every rental. Protective boards are placed under every rental prior to placement of the bin, to ensure the safety of your driveway, or any surface of your property that our bin is placed on. Here are five tips for maximizing your dumpster rental experience, and avoiding property damage all together. Deciding where your dumpster is placed plays a huge role in how efficiently it's used. It's best to place them on a solid, flat surface, most driveways are ideal. Steer away from soft ground locations, like lawns, that can increase the likelihood of sinking or damaging impressions. Is there enough room in the driveway to come & go with your car? (Bin There Dump That bins are about the size of a minivan. Are you blocking any doors? When a Bin There Dump That driver arrives at your home, prior to placement of the bin, protective boards are placed under every rental to disperse it's weight evenly and keep your driveway scratch-free. During your project, what will be the easiest, or most traveled route to and from your bin? With a little foresight, tramping through you flowerbed to get an item into the dumpster can be avoided. And if crossing your lawn is unavoidable, place sheets of plywood down along the path to cut down on damage. When you rent a dumpster, it's designed to take almost anything you're in need to getting rid of, except hazardous materials. From motor oil and gasoline to household cleaning chemicals and pesticides, it's best to check with your city for it's hazardous waste collection procedures. A great online source is a website earth911.com. Simply type in what material it is that you're are looking to dispose of along with your location, and you will be provided with various options for your area. Our residential friendly roll off dumpsters allow for walk-in loading, but once things start to fill up, it's important to make sure that the bin door is securely closed. As you continue loading, a good stopping point will be when your discarded materials are flush with the top of the container. Level loading your bin will help our uniformed drivers to tarp and secure your bin for it's safe travel to be sorted and recycled at a local transfer station. Once all of the hard work and heavy lifting is over, we will be out to as scheduled to pick up your bin. But, before we drive off, part of our property protection system is a sweep u of the area to make sure no debris are left behind. The last thing you want is to run over astray nail while pulling into your driveway. Sweeping will round up any rogue nails, scraps of wood, pieces of glass or chips of paint. 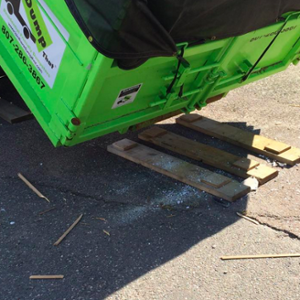 Property protection should play a key role when it comes to renting a dumpster. When renting a dumpster you don't want to have to worry about the possibility of any damage to your property, especially if the company you have chose isn't covered for it. Give us a call or check us out online for your next project! Another wonderful experience with I plumbva team. I plumbva team took the time to explain our options and helped us to choose the best one. I can't stress enough how great these guys are--super flexible and helpful! I had to change details of my drop off a pick up so many times, and they were so friendly and professional. There is no reason to call anybody else. The entire experience was a complete success! The Eagle dumpster company is an A+++ Excellent Company!! !